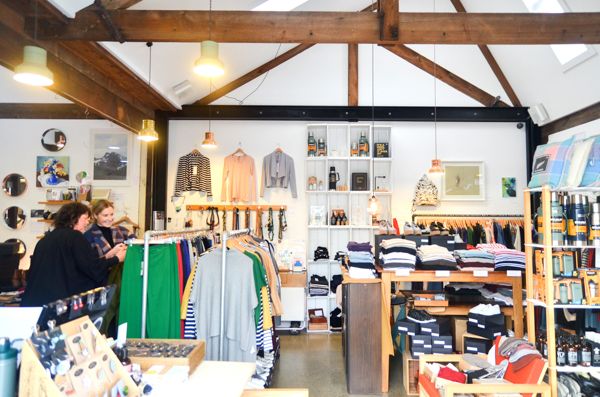 The Flock’s new layout at The Tannery reflects its purpose for selling ethical and sustainable items. With mainly Kiwi tunes playing in the background, it’s befitting for browsing among the locally made fashionwear and gifts. Owner Melody Leveridge only sells exquisite clothing made of natural fibres. It’s where she draws the line – no synthetics. The Labels – Elk, Kowtow and From – all have the Global Organic Textile Standard (GOTS) approval. Elk’s high-quality 100 percent cashmere jerseys also include short-sleeve tops beautiful for layering, and twist-knit merino. Elk boots come in green-blue, tan, burgundy, black and patent leather. Kowtow also designs in organic-cotton, while the From collection features soft, fine-detailed merino. Not forgetting the men, the Stanley extensive range of flasks keeps food and drink piping hot for up to 32 hours. There’s also superb handbags and wallets, natural skincare and Songbird cards hand-drawn in Diamond Harbour. The Flock has a story and a reason behind everything.